Was having dinner here tasting all the regular things I would go for when the brewmaster, Fred, walked up and asked how I liked the Shandy. After exchanging an awkward glance with my friend we informed him it wasn't our thing. He promptly ordered me one and watched me eat crow. It's delicious. Frustratingly so. If it weren't so expensive this would absolutely be a summer staple! L: Cloudy medium golden pour. Thin white head. Modest lacing. S: Tangy citrus. Sweet and fruity. T/F: Zesty lemonade. Not a lot of beer character... mostly sweet/tart lemonade. Crisp and refreshing. Well carbonated. Medium to light in body. Finish is citrus. O: A delicious radler. Nothing fancy... just very well made. My wife loves it, and if I were inclined to drink shandy's this one would be near the top of the list. If you like drinking Lemon Pledge, this is for you. I couldn`t even finish one bottle! I actually gagged on my last swig. Creamy bright yellow with minimal head but a surprising amount of reaching lace. All lemon on the nose, but closer to a lemon bar than lemonade or lemon meringue pie as it is not as sharp and tart in aroma as those as there is a bit of cookie dampening, which actually makes it easier to breath it in with huge whiffs. From all that I've heard, Country Time lemonade is the target. Turbo is not as tart or sour or sweet as either that, or your traditional homemade lemonade--it is very dialed in and precisely balanced. Lemon is the star of the show and is perfectly blended to a very dangerous effect, making it crazily drinkable, especially on a warm, sunny summer day. As such, it is wise to warn the ladies that often flock to the brewery during summer months, especially with the recent influx of variants, on how strong this beer truly is compared to your average fruity beer. Turbo is very full bodied and bright, yet not heavy or bogged down with wheat or grain as other fruit beers are. The malt influence is a bit of sugar cookie and biscuit, but not too sweet. I have absolutely no problem drinking a pint of this shandy, by myself, belly up to the bar. It really is great on its own, but, I'll tell you a not so carefully held secret, when they blend it with Gangster Frog, it really pops! 22 ounce bottle into tulip glass, summer 2015 bottling. Pours lightly hazy pale golden yellow color with a 1 finger dense white head with good retention, that reduces to a ring of lace that lingers. Light spotty lacing clings around the glass. Aromas of big lemonade, lemon peel, lime, grapefruit, wheat, cracker, light honey, light pepper, and herbal/yeast earthiness. Damn nice aromas with great balance of lemon/citrus, bready malt, and light earthy hop/yeast notes; with great strength. Taste of big lemonade, lemon peel, lime, grapefruit, wheat, cracker, light honey, light pepper, and herbal/yeast earthiness. Light herbal bitterness, yeast spiciness, and citrus tartness on the finish; with lingering notes of lemonade, lemon peel, wheat, cracker, light honey, and herbal/yeast earthiness on the finish for a good bit. Damn nice robustness and balance of lemon/citrus, bready malt, and light earthy hop/yeast flavors; with great malt/spice/tartness balance and zero cloying flavors after the finish. Medium carbonation and body; with a very smooth, fairly crisp, and slightly creamy/bready mouthfeel that is great. Alcohol is very well hidden with minimal warming present after the finish. Overall this is an excellent shandy style! All around great robustness and balance of lemon/citrus, bready malt, and light earthy hop/yeast flavors; and very smooth and crisp to drink for the ABV. A very enjoyable offering. I guess I am the sucker for fruit and vegetable brews - I love it when a brewer cooks up a refreshing mix like this. They don't all work as well as this one, but ones like this make the adventure worthwhile. It's a strange, cloudy looking yellow. Citrus hops and soda pop dominate the smell nicely. The taste is mild and refreshing citrus, hop and pop taste. It is both sweet and tart. The whole experience is extremely refreshing and recommended, but I don't think you will find them again until next year (this review was from notes from last summer). 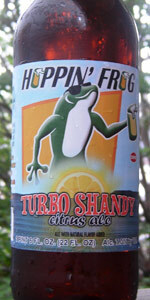 Turbo Shandy - Hoppin' Frog Brewery. Poured from the bottle into a pint glass, this beer's head is 1/2 finger thick, with secular lacing, and a clear straw golden body. I smell a generous helping of sweeter, jucier citrus. It seems natural & non-offensive. Tastes like nice and juicy citrus, perhaps with even a dash of juice in there. Nothing artificial syrup tasting,though. I also can't detect the higher ABV in this usually 5% at the most style. Mouthfeel here is clean and crisp. Very refreshing&would most certainly hit the spot on a hot summer's day. Much cleaner than any _____ -A-Rita I've tried, that's for sure! Overall, I'll give Turbo Shandy - Hoppin' Frog Brewery a 4.5 I might have rated this even higher in the summer months, but its still a very damn good representation of the style. This beer pours an opaque straw color. It is topped with an inch of white head that leaves no lacing. It smells like lemonade mixed with citrus soda. This beer is very sweet. It tastes like powdered lemonade mixed with lemon lime soda. If I was blindfolded I would guess that this was a malternative beverage along the lines of Miller Chill or Smirnoff Ice. Yet some part of me wants to try the barrel aged version. Not sure how to rate this one. It might be a good shandy but I just feel like I'm drinking sunkist.